7 ways to trick your noisy kids into being silent - yes it's possible! 7 ways to trick your noisy kids into being silent – yes it’s possible! There’s no doubt about it – kids are LOUD! You’re constantly telling them to hush, and ear plugs will only get you so far. I’ve even resorted to getting their hearing checked every few months. So what can you do? Get creative that’s what! Here are seven sneaky ways to silence those noisy monkeys. “Who can stay silent for the longest? !” So simple yet it works every time because kids just love a good competition. If you want to really drag this game out you can put a timer on, then jot down the winner’s record and convince everyone to do it again so they can try and beat their time. Once kids hit preschool age they are old enough to understand that they need to be quiet when Mummy or Daddy is on a work call. Sometimes you just need to pull this one out of your hat for a few moments peace. Remember to add a few fake words here and there so they actually believe that you’re talking to someone. A bit morbid to be sure, but kids have so much fun playing this game at any time of day so you don’t have to feel too guilty about duping them. Oh and it’s hilarious to watch them in action too – feel free to get out the camera for a snap! Simply set a timer and tell them that the whole house has to speak in whispers for an hour or they forfeit the chance of winning a cupcake. You won’t get complete silence of course, but aren’t whispers a darn sight better than Little Miss Shouty Pants and Captain McSquealee? This one is perfect for those long road trips in the car or even just a painful drive home from the supermarket. There’s nothing like putting the fear of the police into young children to make them behave! Just tell them that the police have special radars for identifying noisy, naughty kids who are distracting their parents in the car and that if they don’t be quiet you’ll get pulled over and they’ll get in trouble. Yikes! Most kids don’t need any accessories to help them be loud little larrikins, but they always manage to end up with a toy box full of noisy gadgets that they will not only play at full volume but also continue to shout over. So try hiding some of the worst culprits – think drum kits and recorders, fart guns or electric toys that blast loud tunes. When you feel up to it you can easily go and ‘find’ it miraculously. If all else fails, try drowning them out with music. When the children’s noise level gets too much to handle blast your favourite tracks or sing at the top of your lungs. It will catch them off guard and instantly silence them. They may even want to switch shouting for dancing, or sing along too. Just make sure your volume is louder than theirs! 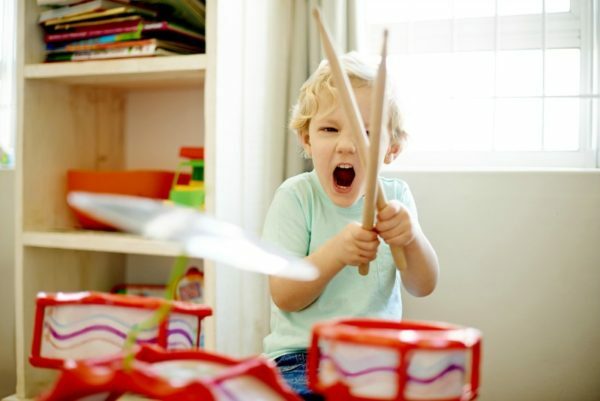 What tricks do you use with your noisy kids?! Tell us on Facebook!